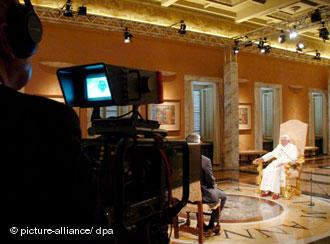 As tipped yesterday morning, the Pope's TV interview indeed ran last night in Germany. Deutsche Welle has done us all the service of translating it. Alternatively, if your eyes are tired and you'd like to hear a dubbed audio version of the 38-minute encounter, Vatican Radio has that. And even more alternatively, if you're like me and enjoy listening to the original audio of something in a language one doesn't understand simply to try to read along and pick up the inflections of voice, etc., Vatican Radio has the uncut German audio as well. As to snip it would be to do Ratzi an injustice, just read/listen to the whole thing. SVILUPPO: Some of you might enjoy knowing that video of the whole shebang is available here.... Worth watching just for the gesticulating and superb camera work, not to mention getting to see how quickly his mind works. Whew.